The Messenger and Advocate was established after a mob had destroyed the printing press of the The Evening and the Morning Star in Independence, Missouri on 20 July 1833, causing the Star to relocate to Kirtland. 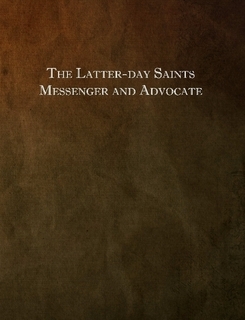 After a brief run, the Star was discontinued in favor of a uniquely Ohio newspaper, the Latter Day Saints’ Messenger and Advocate. Oliver Cowdery served as editor and the first issue was printed in October 1834. The May 1835 issue was the last with Cowdery as editor, because there was “other business and other duties, in which my services are requisite.” John Whitmer replaced Cowdery as editor. He may have been heavily assisted in his duties by William Wines Phelps. In March 1836 Cowdery again became editor when both Whitmer and Phelps returned to Missouri. Cowdery’s brother Warren claims that he was actually performing the editorial duties. In February 1837, the printing press was sold to Joseph Smith, Jr. and Sidney Rigdon, and Warren Cowdery became the official editor. The last issue was published in September 1837 after LDS Church leaders became dissatisfied with Warren’s efforts. In October 1837 the newspaper was succeeded by the Elders’ Journal.